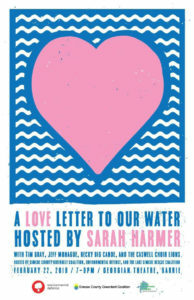 We are thrilled to announce that Sarah Harmer is coming to Barrie for a special concert to raise funds to promote and protect water in Simcoe County and beyond. Joining Sarah will be Tim Gray, Jeff Monague, Becky Big Canoe, and the Caswell Choir Lions. The concert will be held at the Georgian Theatre, 1 Georgian Drive, Building C on Friday February 22, from 7 – 9pm. Tickets can be purchased here, and the Facebook event, if you’d like to share, can be found here. It looks to be a special night! Hope to see you there.